The place to start is in Pittsburgh. Obviously. I would always start in Pittsburgh. Why are we starting in Pittsburgh? The trend toward globalization is so powerful that it's affecting everywhere. And the best place to start a conversation over globalization and how it's transforming the way we live and work is over a Primanti's sandwich. Any kind of meat that you want. And then, here's the claim to fame, they put the french fries on the sandwich. And the cole slaw. On the sandwich!? All right, let's go to Primanti's. 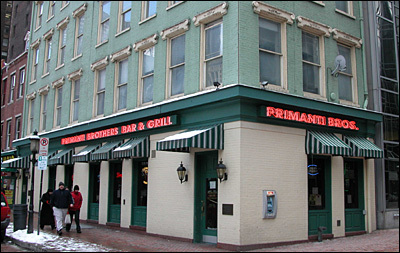 Primanti Brothers Bar & Grill in Pittsburgh, PA.
Primanti Brothers is now a small chain, but the Primanti family opened its first restaurant in the 1930s, feeding midnight lunches to dock workers. It was a favorite for generations of workers from the steel mills. "Okay your steak sandwich is coming right now," says Carlo Carrabbia, one of the guys flipping ingredients on the big griddle behind the bar. "I put all the fries on it," says Carlo. He has, in fact, placed the fries inside the sandwich. The 1970s icon, Barry White, is on the stereo. On the walls are photos and murals of the powerful Pittsburgh Steelers football teams of the same decade. Primanti's seems locked in a time, thirty years ago, just before Pittsburgh's big collapse. In an earlier wave of globalization, cheaper and more nimble foreign competitors took away America's hold on steel production. "Really, there was, in that '82, '83 period, you're talking a minimum of 100,000 manufacturing jobs alone that went away," says Christopher Briem, a Pittsburgh native and a regional economist at the University of Pittsburgh. From the 1970s through the '90s, Pittsburgh lost almost two-thirds of its manufacturing jobs, and a third of its population. "This used to be the Homestead Steelworks," says Briem as he drives the low, flat land along the Monongahela River where tens of thousands of workers earned a living for more than a century. But what's left is not just the ruins of the steel mill. In the 1990s, developers built something new. "This is a large mix of retail, residential, light office development," explains Briem. "A lot of big box stores. Lowe's and supermarkets, and Pier 1 right there." After Big Steel went away, service industries grew from one-fifth of the Pittsburgh economy to one-third. This was back in the time when lower-paying service jobs replaced factory work in much of the country. Pittsburgh hasn't come close to replacing its lost manufacturing jobs. But it's gained thousands of new jobs in healthcare, finance, service and high-tech industries. Led by its universities, the city is working to shake its rustbelt image and become an IT leader.